Usher in the New Year at the prestigious Atlantis The Palm. Dubai Most Exclusive New Years Eve Bash is Here ! 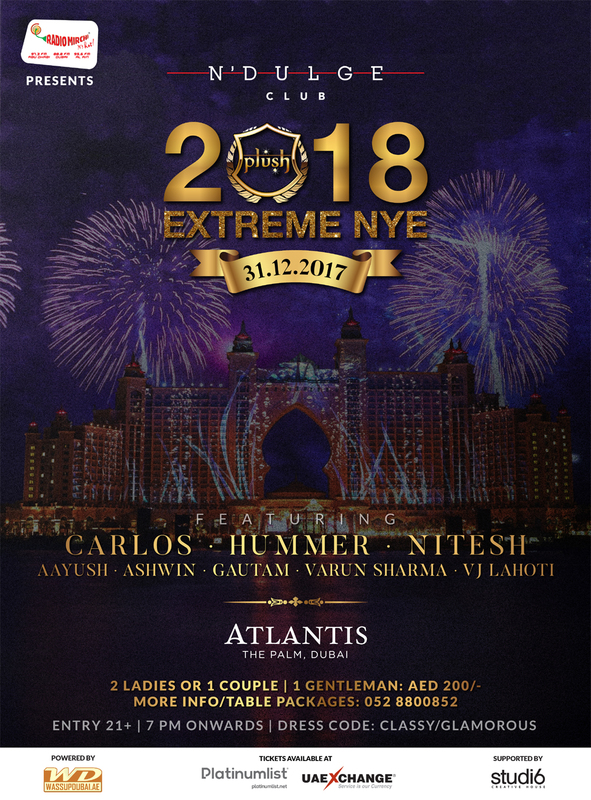 Radio Mirchi UAE presents Plush Extreme NYE 2018 at The Ndulge Club in Atlantis The Palm. Sway all through the night to the thumping beats of DJ Aayush, DJ Ashwin, DJ Carlos, DJ Gautam, Dj Hummer, DJ Nitesh, DJ Varun Sharma & VJ Lahoti spinning the best in Bollywood & Commercial music all night long. Ticket Priced at Aed 200 (Admission for 1 Couple / 2 Single Ladies / Gentleman) and available online at PlatinumList.Net (Direct Link: tiny.cc/plushnye2018 ) or any UAE Exchange Outlets. Dress Code: Classy / Glamorous. For info & VIP Table Reservations call +971 52 88 00 852.